During Rev. Graessles pastorate, the congregation increased so rapidly that it became the largest in the city. In addition, Rev. 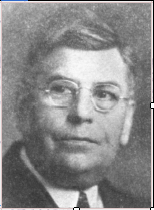 Graessle served the congregation at Olentangy and Sulphur Springs. Owning to the growth of the congregation here, he later gave up these two charges to devote his entire time and strength to his charge here. During Rev. Graessles pastorate the church was refrescoed, gas was introduced for lighting purposes and a $1,000.00 pipe organ was installed which served the congregation till 1895. Finally, he was also successful in prevailing upon the congregation to buy a parsonage property located on the southeast corner of Poplar and Charles Streets, where our present church office now stands, for $1,600.00. The question of establishing a parish school arose at this time, which would have been a most opportune one for such a school. But either the time was not ripe, the need not seen, or the financing too great a burden, for the matter was laid aside till a more appropriate time which, unfortunately, never came. It was through Rev. Graessle influence that instruction in the German language was given in the public schools of our city. Rev. Graessle resigned his pastorate here in 1880 and moved to Rockford, Illinois, where he died in 1888. His body is buried at Jacksonville, Illinois. His family returned to Bucyrus, Ohio. Rev. C. Eirich was pastor of this congregation from 1881 till the end of the year 1887. Under his administration, nothing of unusual importance occurred, but affairs seemed to be taking their regular and natural course. Pastor Eirich was an excellent speaker, always endeavoring to uplift his listeners. When he resigned his pastorate here in 1887, he also resigned the ministry and moved with his family to a farm near Van Wert, Ohio. The successor of Rev. Eirich was Rev. F.W. Deiss who has been educated for the mission field and served the church in the capacity of a missionary at Jerusalem, Palestine for some time. His pastorate here was brief; soon after his arrival, he became ill. Death claimed him at the age of 54 years, after serving the congregation less than three years. His body is buried at Oakwood Cemetery. For some considerable time after his death, the congregation was vacant. 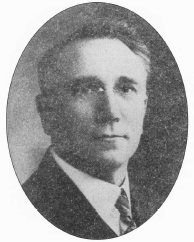 During the vacancy, the congregation was served by theological student A. Niclos, later to become pastor at Ann Arbor, Michigan. In the fall of 1890, a call was extended to Rev. C.F. Gebhardt to become pastor of Good Hope Church. Rev. Gebhardt accepted the call and moved here shortly afterwards. He was a very gifted man with a genial disposition. In consequence of this and his earnest preaching, the congregation experiences such a remarkable growth that the old church became too small and a new church edifice became an urgent necessity. As a result of his ever faithful labors, the present church building was erected. However, before the construction of the new building was started, Rev. Gebhardt health began to be impaired, and he felt a need of a rest. The congregation granted him a leave of absence during which time he visited Europe. Upon his return, he seemed greatly strengthened, but the gain was not permanent. 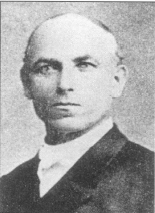 His supply pastor during his absence was student F. W. Abicht. On June 7, 1891, the congregation decided to build a new church if the necessary funds could be raised. On July 12, 1891, a committee was named by the congregation to get subscriptions toward the building of a new church. By October, this committee reported that over $11,000.00 had been subscribed. The selection of a location presented some difficulties. Most of the members favored the locations of the parsonage, the southeast corner of Charles and Poplar Streets, which location it now has. The dimensions agreed upon were: length, 88 feet, width, 64 feet. The tower reached a height of 169 feet, not including the 12 foot cross on top of the tower. The expenditure for a realization of this plan was set by the architects at $16,381.00. Chas. Roehr and Sons were given the contract. The contractor took the contract for the stipulated sum with the addition of the old church building whose worth was appraised at $3,000.00. The cornerstone of the new church was laid August 12, 1892, in the presence of a large crowd. Pastor W.F. Helle of Upper Sandusky, Ohio conducted the German service; Prof. D. Loy of Columbus, Ohio, the English. On Sunday, October 29, 1893, dedication services were held. With interior furnishing, the cost of this new church reached the sum of $26,000.00. On the day of dedication, $21,000.00 had been paid. The following members served as building committee: Rev. C.F. Gebhardt, president; Frank Liebich, secretary; Frank P. Donnenwirth, treasurer. The remaining members were P. Barraider, John Myer, Geo. Mader, A. Ulmer, J. Karg and Christ Walther. J.C. Johnson of Fremont, Ohio, was the architect, Chas. Reler and Sons, the contractors, and C. Walther, the builder. At the dedication, which occurred October 29, 1893, Dr. F.W. Stellhorn, of Columbus, Ohio, preached the German, and Rev. Geo. 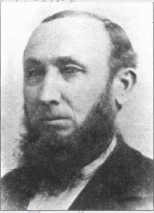 Dillman, of Fostoria, Ohio, the English sermon. Dr. Julius Sturm, of Germany, a friend of Rev. Gebhardt, composed the German dedication hymn, which was sung by the congregation at the dedication services. The church has a seating capacity of 700. Upon entering, one is immediately impressed by the beautiful interior and its worshipful atmosphere. All the woodwork and pews are hand carved from hard oak and are finished in natural color. High above the church on a 165 foot spire stands a cross reminding all who approach the city from every direction of the Savior and His sacrifice on Calvary. Moved by this cross and its silent message, many seek to unburden their souls of sin. Huge bells call the worshippers to this house of the Lord. The church has a beautiful, worshipful atmosphere with a life-size statue, on the altar, an exact duplicate of Thorwaldse's The Christ, craved from wood by Carl F. Broemel, a local resident who presented it to the congregation as a gift. Just a few months after the dedication of the church, a fire started in the basement of the church which would have been disastrous had it not been discovered in time. The smoke blackened the entire interior of the new and beautiful edifice. This occurred in January, 1894. Rev. Gebhard health gradually declined, after the construction of the new church had begun, until his death claimed him on February 18, 1897. His body rests in Oakwood Cemetery, by the side of his predecessor in office. Soon after Rev. Gebhardt death, Rev J.W. Kuntz was called to become pastor of Good Hope Lutheran Church. He accepted the call, and in the latter part of May, 1897, was installed into his pastorate by Rev. Dr. G.H. Schodde of Capital University, Columbus, Ohio. At this time, a debt of $3,000.00 lay on the congregation. By 1900 it was lifted and the congregation was free of debt. Since the old parsonage had been sold and the location used for the new and present church edifice, the congregation decided to purchase, in 1901, a parsonage located at 323 S. Walnut St. for $3,500.00. By the next year, $2,000.00 had been paid of this amount. There were at this time about seven hundred fifty communicant members. September 24, 1905, the church was refrescoed, and a new pipe organ was installed. Later, in 1907, at the tenth anniversary of his pastorate, the congregation gave the pastor a leave of absence for three months, together with a neat little sum of money. Both time and money were used in making a tour of Europe. In addition to serving the congregation here, Rev. Kuntz served at Olentangy for two years and at Martin Luther for one year. Through his influence the Martin Luther congregation joined the Ohio Synod in 1907. Three years later, Rev. Kuntz received a call to Bellevue, Ohio, which he accepted. Because of impaired heath, he later moved to Pemberville, Ohio. In November, 1910, a call was extended to Rev. O.A. Bertram of Toledo, Ohio, who entered upon active duties of his office January 15, 1911. His induction services were conducted by Rev. Kuntz. The congregation continued to grow spiritually and numerically, the communicant membership in 1916 being over one thousand. In 1912, the congregation purchased property to the south of the church at a price of $4,000.00 which sum was paid almost entirely by the various societies of the church. The rear portion of the lot, together with a part of the plot of ground to the east of the church, was used for the construction of the present parish house whose cornerstone was laid on Sunday, September 12, 1915. Dedication services were held in April 1916. Cost of this structure exceeded $30,000.00. The interior of the church was revarnished, the sacristy recarpeted, new candelabra placed on the altar and other improvements were made in 1915. Individual communion cups were introduced in the spring of 1916. The set of trays and art glass cups were presented by Mr. and Mrs. Lewis Mollenkopf. Refrescoing of the church, redecorating of all woodwork, installing of a new lighting system took place in 1922. Completion of the new parsonage on the site of the old parsonage, which was razed, took place in 1926. The estimated cost of this home was $20,000.00. Rev. Bertram pastorate here was conducted May 15, 1934 after serving the congregation for twenty-three years and four months. From here he went to New Baltimore, Michigan, but since May of the year 1941, he lived in Howell, Michigan.